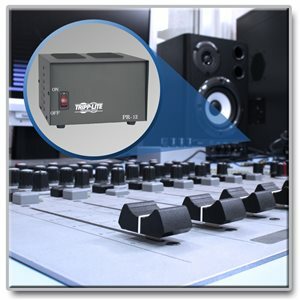 Precision regulated DC power supplies are ideal for commercial/land-mobile, ham and CB radios, test bench supplies, base stations, tape players and amplifiers. Designed for years of reliable service and superior performance, they efficiently convert 120 volts AC into 13.8 volts DC (+/-0.5V). The Trim Line Series of DC power supplies offers a low-profile design with a footprint that matches the most popular radios on the market, such as Motorola, Radius, GE Monogram Series and EF Johnson models. Get regulated, precise DC power from any AC input with Tripp Lite’s PR12 DC Power Supply. The PR12 efficiently converts power from an AC source to 13.8 V DC, providing perfect input for sensitive equipment like commercial/land-mobile, ham and CB radios, test bench supplies, base stations, car radios, amplifiers and point-of-sale displays. With a solid state, integrated circuit and 12-amp capacity, the PR12 maintains excellent output voltage regulation so no power disruptions affect connected equipment and devices function at their peak. Provide DC power from an AC power source to VHF/UHF ham radios, transmitters, commercial radios and a variety of other devices. With a heavy-duty power transformer, the PR12 completely isolates equipment from utility AC power disruptions. Current-limiting electronic foldback enables timer-controlled automatic overcurrent protection, eliminating the risk of overvoltages harming sensitive components. A crowbar circuit provides even further protection against equipment damage. An illuminated power switch offers one-touch control. Noise disruptions on the AC line can damage equipment components and lead to failure over time. The PR12 protects systems from line noise by filtering AC power as it converts it to DC, leading to very low noise operation. This lets DC-powered equipment maintain optimal capability while also protecting your application from incremental damage. A combination of compact size and color harmonize the PR12 with all modern communications equipment set ups. Inside the unit, large heat sinks emit heat through the PR12’s vented cabinets for cool, continuous operation and long component life. The PR12 is backed by a one-year warranty and is manufactured in compliance with strict RoHS specifications.